Let me tell you, briefly, about Odessa Simon: Odessa Simon was a sniper. She was a complete badass. She had jet-black skin and kept her white hair slicked back, and she solved problems if those problems were Aliens Being Alive. She’d get herself into position and line up her shots and rarely, if ever, miss. Every shot a kill. She was the jewel in the crown of my elite alien-fighting unit in XCOM. Odessa Simon died because I got cocky and put her too close to the enemy. She’d been with me since the start of the game, and she was dead, and it was all my fault. I didn’t want to live in a world without Odessa, so I made a new world, and I didn’t want to suffer those feelings of loss again, so I made Project X. In my new save, I would never get attached to another operative, because ll the operatives on my new save would be featureless, nameless clones. 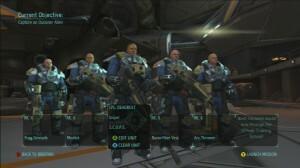 Of course, when you recruit soldiers, they have names and hair and the potential to display a personality, and I had to change that through the customisation options on their profiles. It all started to feel pretty grim. 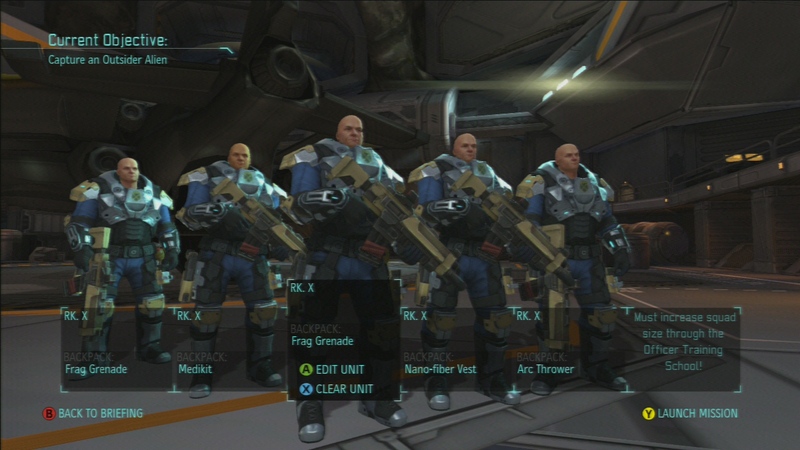 If I could recruit bald, pale-skinned, visually identical troops I’d feel much better about the process, but every new soldier that turns up has to be Customised. 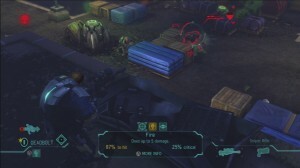 It’s testament to XCOM’s character creation process that, randomly-generated as they are, I start to feel bad about erasing their identities and leaving nothing in their place. There were a few speed bumps, early in the process. 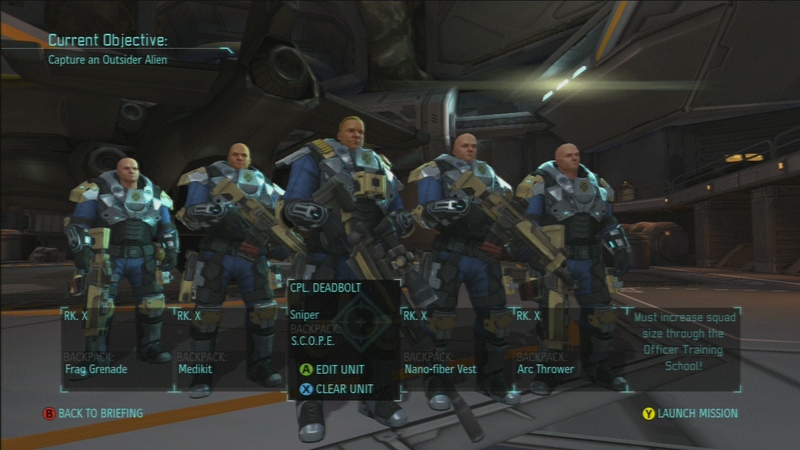 It’s unsurprisingly difficult to command my troops in battle as every single trooper is called “Soldier X” and they all have the same bald head, so quite often in the early stages I’d put the wrong person on overwatch or run snipers out of cover thinking that they were assault units. It didn’t matter, though. I didn’t care about them at all. I cared whether they died; not because of the narrative we shared together, but because character death represented a loss of time and effort that would take ages to do over. I started to feel myself disconnect from the game. I had nothing to attach myself to in these faceless replicants; no sadness when they died, no glory when they won. In desperation, I made up a new rule for Project X – any veteran soldiers earned from missions would be allowed to keep their own identity. A new French sniper called Deadbolt became the lynchpin of my team. I’d make sure he was covered by his team-mates, give him the best firing lines, and never see him walk away from a battle with anything more than light wounds. But what, I began to think, did Deadbolt think of all this? Handed over by the French military as thanks for rescuing their civilians from alien abduction, he entered a world he never knew existed. He and the Clones live and sleep in the same barracks, for God’s sake. How could he talk to them, with their identical voices and faces? How could be sleep at night, hearing the pitch-perfect matched snores rolling out of their wet, pink, new mouths? What would he think of me? That I can only deal with the deaths of my soldiers by effectively killing them first myself, scrubbing out every last human trace they had until they no longer counted as people? I lost connection with Deadbolt, too. I didn’t want to try and pin all the confusion and self-loathing I had with the Project at this time onto a single Frenchman. I would send my troops into battle, clones and non-clones alike, and they would fight hard and take risks; often, every single member of a team would be injured in some way, or dead. I didn’t mind; they’d be fine in time for the next mission. Or someone else could take their place. How many have I damned in Odessa’s memory? XCOM is a big game and I’m nowhere near completing it. It’s leaving me drained, to be frank: partly from the way that I’m systematically destroying their humanity and partly from the fact that the clones are no fun to command. There’s no last-ditch defences or valiant headstrong attacks, no real or imagined character perks or foibles, no ongoing stories. There are only successful clones and dead clones. Still, I’m pressing on. The world has to be saved, after all. I’m not ashamed to admit that my roleplaying has got out of hand, and that this is all a simulation and I should stop caring about the made-up soldiers in their made-up war. Maybe it drew some uncomfortably close comparisons with the way that modern military forces treat their new recruits. Maybe I couldn’t distance myself enough from what they were supposed to be, and what I had made them into. Not really, Shen, no. Not really. Grant Howitt is a freelance games journalist who regularly writes for publications like The Guardian, PSM3, and FHM. He's been gaming since his mum got him a second-hand Mega Drive when he was seven, and he hasn't looked back since. Favourite games include Max Payne 2, Ocarina of Time, GTA San Andreas and Shadow of the Colossus - anything third-person with plenty of style. When not playing video games he's playing tabletop RPGs (or writing them himself) and running Zombie LARP, which is a LARP, with Zombies in. Grant is incredibly available for commissions at this time and will generally work for a cup of tea and the bus fare home.